SE17 is Walworth. Walworth is one of those parts of London that is quite hard to place as it has kind of slipped off the map. This is probably to do with the fact there has been no railway station in Walworth since 1916 nor is there a very visible focal point, like a square or green. 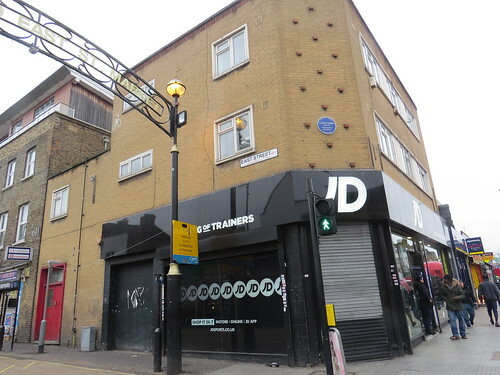 It is centred on a long shopping street which is not even called a Walworth High Street or High Road – it is just called Walworth Road. 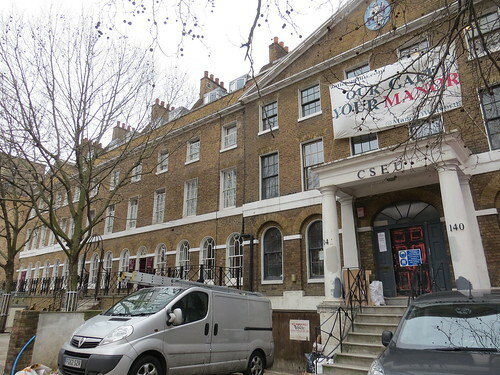 We start our walk at Walworth Post Office at 234 – 236 Walworth Road. Turn left out of the Post Office and take the first street on your left. 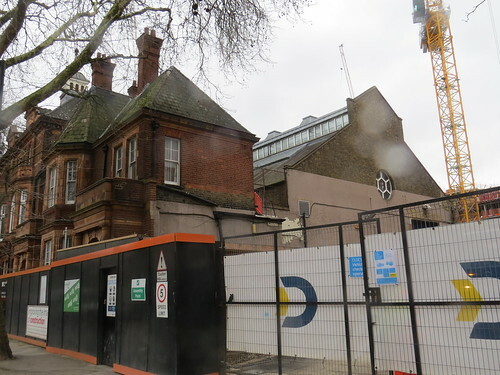 This site is currently under redevelopment but it used to be a Southwark Council facility which included a waste transfer station, bath house buildings, as well as offices. Number 33, Manor Place is a grade II listed building, originally constructed in 1898 as public bathing pools and a wash house. The bathing pools were closed in 1978 and then Southwark Council used the space as offices and storage. 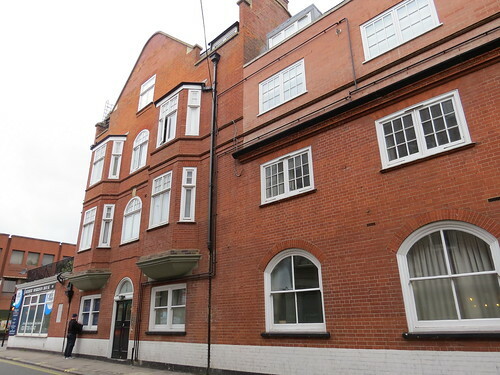 The site also includes Numbers 17 – 21 Manor Place. Completed in 1899, they once housed a coroner’s court and mortuary. The plan is for 270 residential homes with a mix of market, intermediate and affordable units. 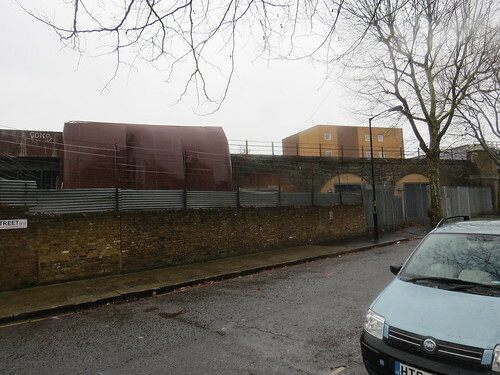 Alongside the new homes, there are plans to develop a commercial space, created within under utilised existing buildings and within the railway arches that cut through the site. 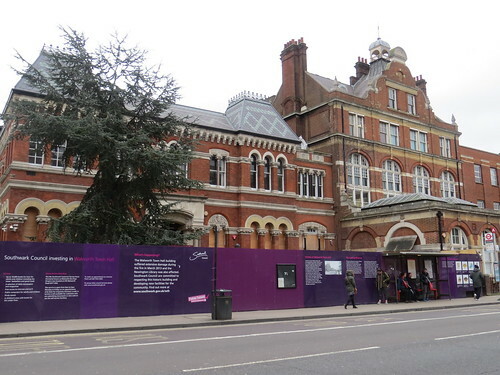 According to Notting Hill Housing’s website, the plans also retain the listed heritage structures 33 Manor Place and the neighbouring former Pool Building, for residential and commercial uses respectively. And if you look at the building behind the red brick one on the street, there is an interesting structure that looks like the Pool. 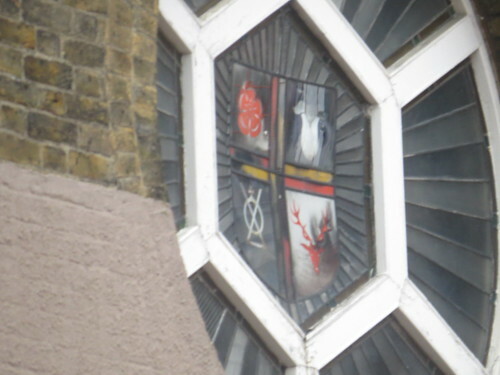 In the gable end there is a round window with some coloured glass. No doubt this feature will be retained somehow. 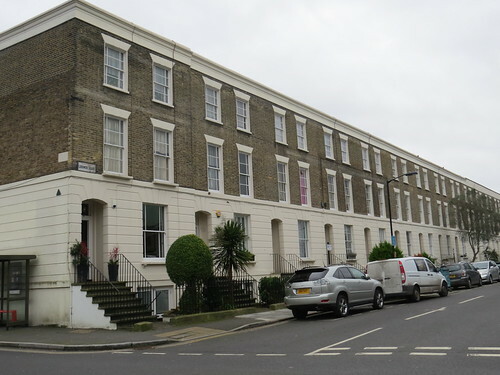 Return to Walworth Road and turn left continue along Walworth Road until you reach an elegant terrace. This terrace is mentioned with faint praise by architectural guru Pevsner. 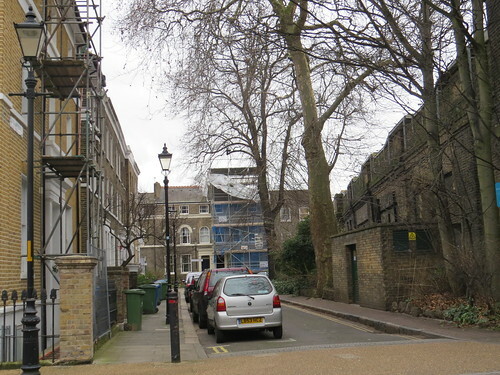 Pevsner says “Walworth Road has just one part of the late 18th century terrace which enables one to visualise how happy and unadventurous the road once looked. 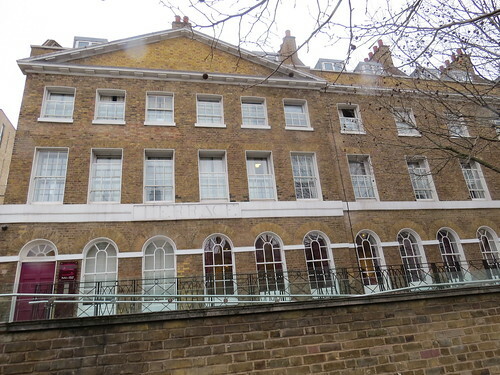 Number 140 – 152 [were] built circa 1790 for Henry Penton (of Pentonville)”. Today it is the home of the Confederation of Shipbuilding and Engineering Unions, an umbrella body for various unions. The confederation dates back to 1890 and today because of the various mergers of unions it consists of just five unions: Community; GMB; Prospect; Union of Construction, Allied Trades and Technicians; and Unite the Union. Our next stop is just over the road. This is a complex of municipal buildings, the first of which was built by the Vestry of St Mary Newington, a predecessor of the borough of Southwark. 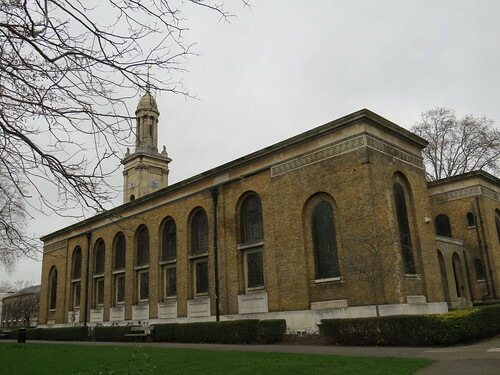 When the parish of St Mary Newington merged with other local parishes in 1900 to form the Metropolitan Borough of Southwark, members of the vestry of St Mary’s fought hard for the new borough to be called Newington. While this didn’t happen, Newington Vestry Hall became the town hall for the newly formed borough. This was also the location of the Cuming Museum. Richard Cuming, and his son Henry Syer Cuming, had a passion for collecting. 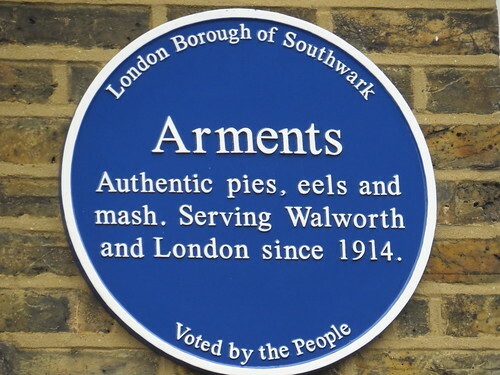 They lived in Walworth and Kennington during the late 18th and 19th centuries. Between them they acquired all kinds of objects from around the world – from clothing worn by North American Inuit people, early taxidermy from Europe and shoes from across Africa to superstitious charms from across London or tickets and toys from local fairs. Henry died in 1902 and left funds in his will to create a public museum to house his family’s collection. The Cuming Museum first opened in 1906 in galleries above Newington Library. The museum opened new public spaces on the ground floor of the Town Hall in 2006. It was also Southwark’s local history museum. Sadly a fire broke out on 25 March 2013, destroying part of the Town Hall roof and the Council Chamber, with further water damage to lower floors caused as a result of fighting the fire. And next door is our next stop. This was built in 1937 and Pevsner does not even deign to comment – it is just mentioned without description. 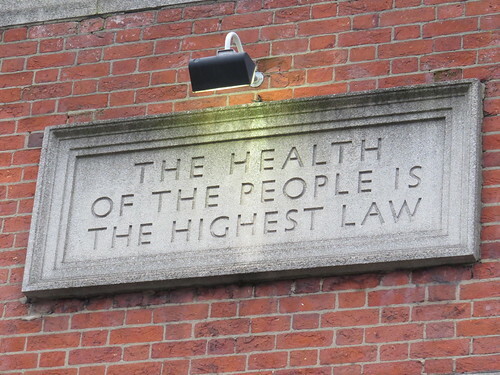 I guess as this was built before the National Health Service was created, it was the borough council who were behind the development. Interestingly this building is still being used to deliver health services. 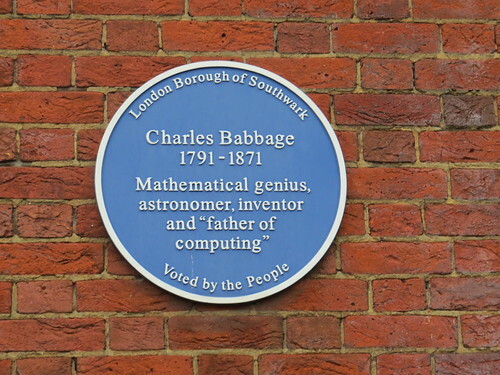 Babbage’s birthplace is disputed, but according to the Oxford Dictionary of National Biography he was most likely born at 44 Crosby Row, Walworth Road, London. However if you look up Crosby Row today it is in the Borough area and nowhere near Walworth Road. So I am not too clear why the plaque is here. Babbage is considered by some to be a “father of the computer”, He is credited with inventing the first mechanical computer and all the essential ideas of modern computers are to be found in Babbage’s analytical engine. Keep going along Larcom Street and you will find another Southwark plaque by the side entrance to the clinic building. This one is to Michael Faraday. Now according to the Oxford Dictionary of National Biography he was born in Newington Butts which is also not here. I have been unable to find out why this site was chosen for the plaque. It makes no sense. 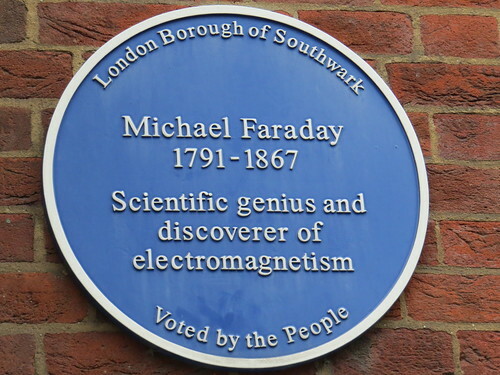 Anyhow, Michael Faraday was an English scientist who contributed to the study of electromagnetism and electrochemistry. His main discoveries include the principles underlying electromagnetic induction, diamagnetism and electrolysis. Go back to Walworth Road and turn left along the main road. 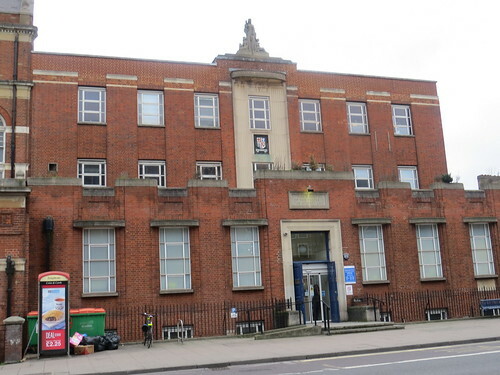 It was used by the Labour Party as its headquarters until they moved to Transport House in Westminster in 1928, where they remained until they came back to Walworth Road in 1980. 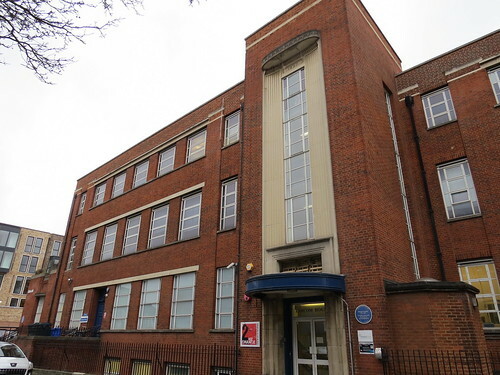 Hence I guess the name Herbert Morrison House, as he was a leading Labour local and national politician in the first half of the 20th century. 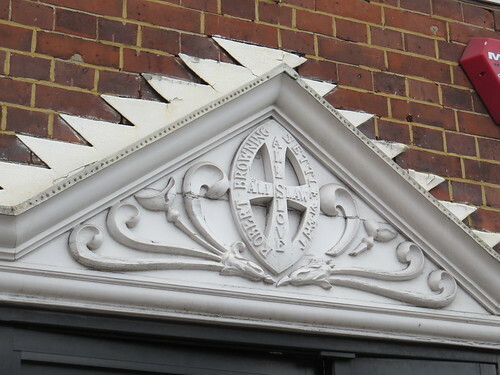 But this building has an earlier life as evidenced by the little crest over the door which says around the outside “Robert Browning Settlement” and the words “All’s Love and All’s Law in a cross formation in the middle. I report, as a man may of God’s work – all’s love, yet all’s law”. And there is a stone commemorating the opening of the building. 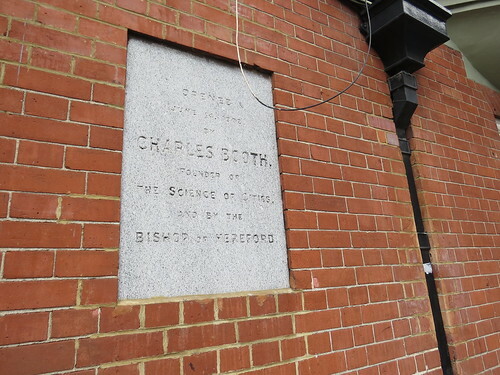 I guess this is the same Charles Booth who created the maps showing the relative affluence or poverty in London. 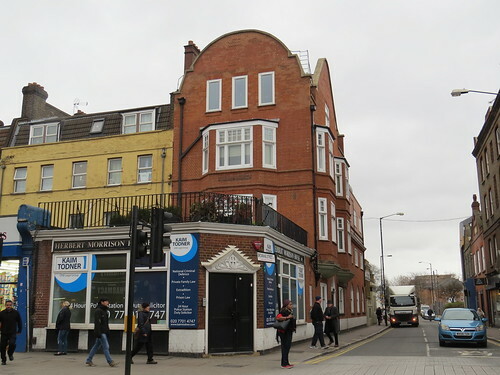 This building was the home of the Robert Browning Settlement which was closely associated with a nearby Chapel and aimed to address poverty and alleviate distress in Walworth. The Browning Settlement was publicly inaugurated in November 1895, with an address given in the nearby Browning Hall by senior Liberal politician Herbert Asquith. It established itself, initially as the ‘Browning Club’, in the building on Walworth Road in 1902. Sadly the Chapel is no more. The original Browning Hall and the chapel were demolished in 1978 following extensive damage from a serious fire. All that remains is part of the burial ground, which is our next stop.. But there is still a little reminder of the Robert Browning Settlement on the building now known as Herbert Morrison House. If you go along Browning Street, you can see where Browning Hall and the York Street Chapel once stood. 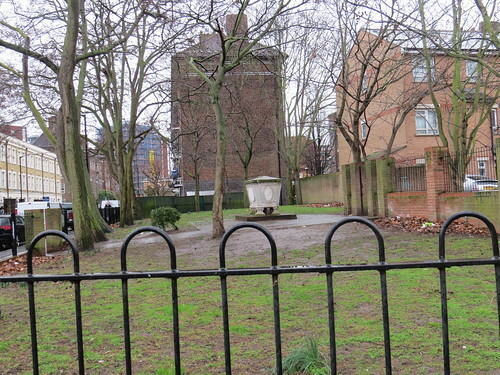 Part of the site, which was the burial ground has survived as a scrubby little open space. And there is just one tomb chest left sitting in splendid isolation in the middle. Now return to Walworth Road and turn left. Our next stop is the side street on your left. 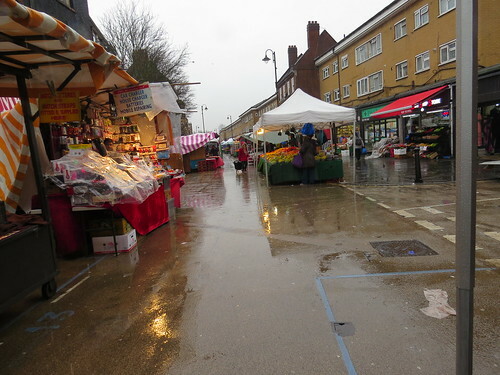 Street trading has been a long tradition in Walworth but originally it was done along the main road. The arrival of trams in the late 19th century brought an end to the market along Walworth Road and the market was split up and moved into the side streets of Westmoreland Road, East Lane (today’s East Street) and Draper Street. 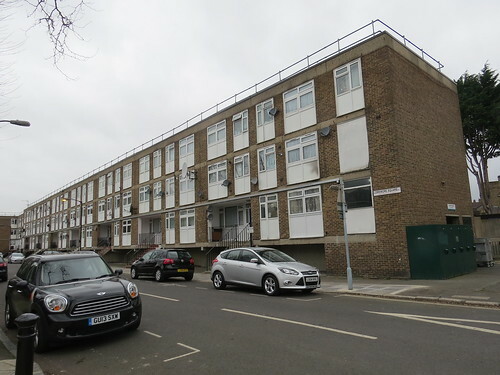 Draper Street was built over in the 1960s by the Elephant and Castle development. The market in Westmoreland Road is still just about there I believe. East Street has survived because like the local population it has diversified so it offers more than just the traditional fresh fruit and vegetables. Fascinating fact: East Street is said to feature in the title sequence to the television programme Only Fools and Horses which was set in Peckham and filmed in Acton amongst other places. 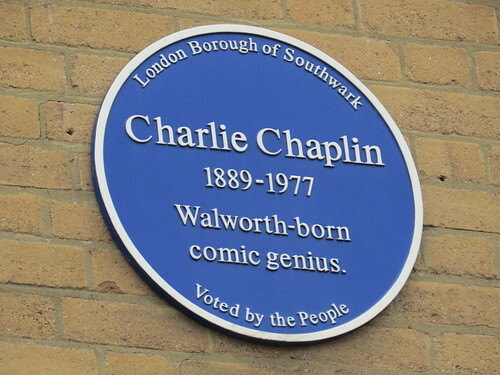 Up at the first floor level of this shop this Southwark Blue Plaque commemorates the iconic comic, Charlie Chaplin. He was born locally and as a child he moved frequently so there are many addresses with a Chaplin association. However I am not sure he actually had a connection with this exact location, although he is thought to have been born in East Street so it was somewhere near here. 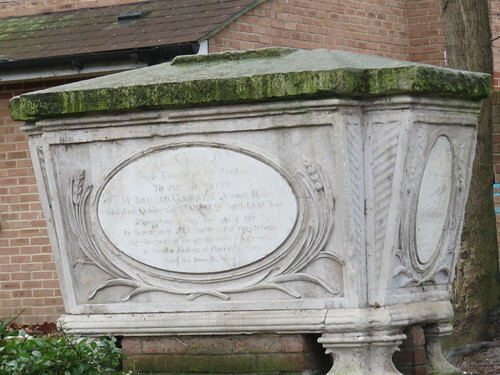 It was perhaps just a convenient and very visible place for Southwark to put their plaque – especially given the English Heritage one is at Glenshaw Mansions, Brixton Road, SW9, over the border in Lambeth, as is the one we saw in Kennington Road SE11. This is a delightfully elegant church. 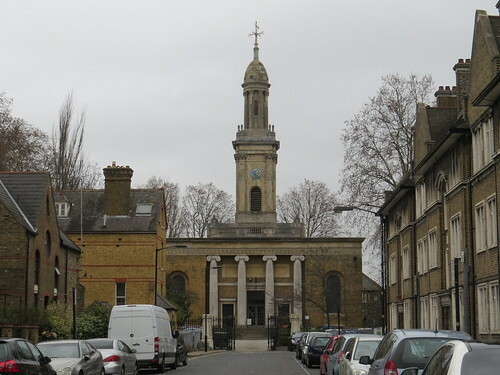 It was built between 1823 and 1825 and was the first of three churches designed by Sir John Soane, in the wave of the church-building following the Napoleonic wars. 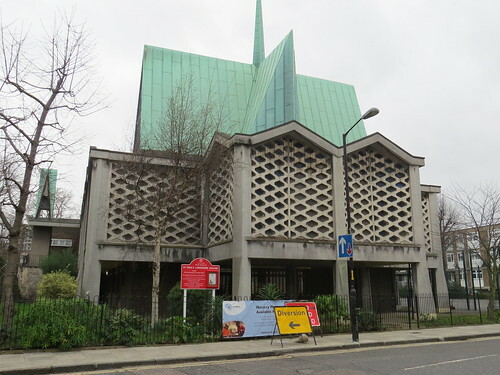 Architectural commentator, Pevsner says it is “not as interesting as the Soane church at Bethnal Green.”. The church was hit by two bombs on 29 October 1940. Hundreds of people had taken shelter in the church’s crypt and over 70 lost their lives. 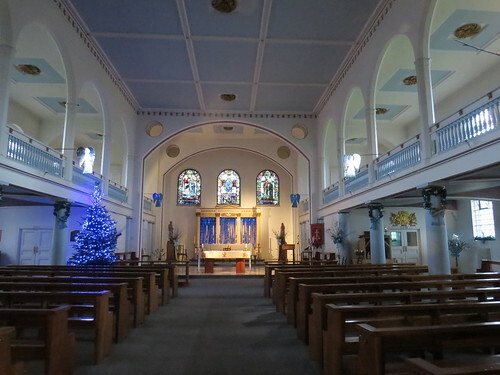 The church was restored after the war and rededicated in 1953. Now go down the right hand side of the church through the gardens and exit the gate. Go down the side street called Lytham Street. Turn right into Merrow Street and then left into Queens Row. Then just before the end turn right into Westmoreland Road. I saw no sign of market here now but maybe I was here on the wrong day. Our next stop is on the right as you go towards Walworth Road. 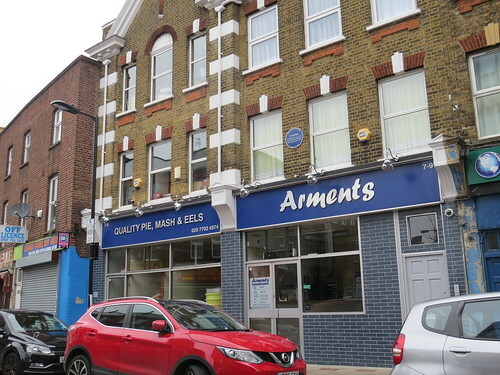 It does not look much, but it is a long established pie, eel and mash purveyor – and it is not called Manze! The outside has lost any kind of old style shop front, but inside it is quite traditional. But they have entered the 21st century with their own website, patriotically resplendent in red, white and blue..
Now continue along Westmoreland Road and turn left into Walworth Road, Cross over and go down John Ruskin Street. You will see a railway bridge ahead and that is our next stop. The railway line which parallels Walworth Road was opened by the London, Chatham and Dover railway in October 1862. Today there is no station here but there was once. It was initially called Camberwell Gate and did not open until May 1863. It was renamed Walworth Road in January 1865. The station was built on a viaduct over three roads with an entrance in a street called Beresford Street (now John Ruskin Street) from where stairs led up to the platforms at the south end of the station. The station was initially well used but the arrival of electric trams along Walworth Road in 1905 dramatically affected traffic. The station was one of a number of inner London stations closed in early 1916 as an economy measure during the First World War. Although it was billed as a temporary measure, the station was never to reopen. Below is where I believe the station entrance was. 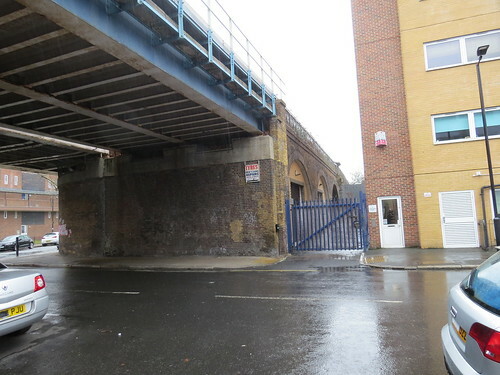 And if you go under the bridge to and turn right into Peller Street you can see there is no wall alongside the tracks here, so I guess this is where the platforms once were. Now retrace your steps to Walworth Road and turn left. Then turn left into Macleod Street ( by Iceland). You will soon get back to the railway and this is our next stop. 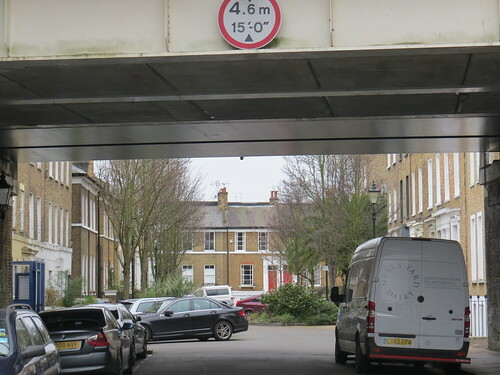 Sutherland Square is unusual in that it has a railway viaduct running right through it. As we have just heard, this line dates from 1862. In building it, the railway company just ploughed through this square rather than go round it or indeed buy it all up and knock more of it down. It does suggest that the railway was somewhat more influential than the people who owned the land. Some years ago, when house hunting I actually looked at a house on the east side of Sutherland Square. It had no original features as the house had been severely damaged in the war and the bottom part of the four storey building had been converted into a separate “granny” flat. But the thing that put me off was the fact it looked right on to the railway viaduct and the trains went past at second floor level – frequently. Needless to say I did not buy. Now walk though the square and you find it actually opens out and begins to look more like a square. Shame about all those bins but I guess they have to go somewhere. Exit the square ahead and you reach a cross street. go over that and down a path under a building which spans the path. then take a right into Chapter Road and our next stop is just ahead. 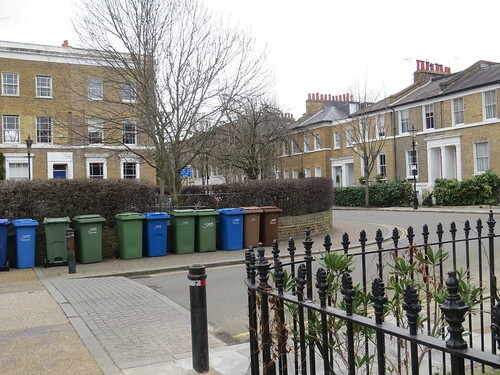 The first part of Lorrimer Square you get to has a row of original houses on the left. These date from mid 19th century according to Pevsner. And sitting ahead like an alien spaceship is St Paul’s Church. Much of this area was devastated by bombing in 1941 and the original Victorian church of 1856 was destroyed apart from the steeple. 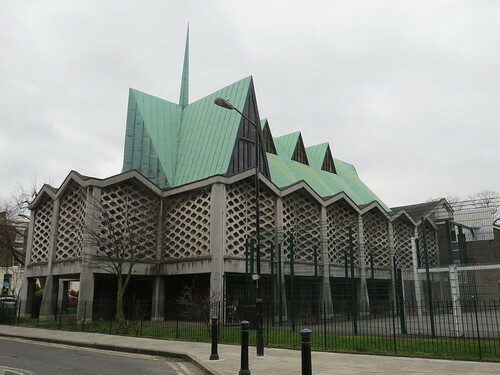 A dramatic new church was built on the site – opening in 1960. If you keep walk past the church you can see that there is little left of the original square apart from that first stretch we saw just before the church. We are now at the end of our SE17 walk. This I now realise is the first postcode I have been to that does not have a working railway station, which given its inner city location is quite a surprise. 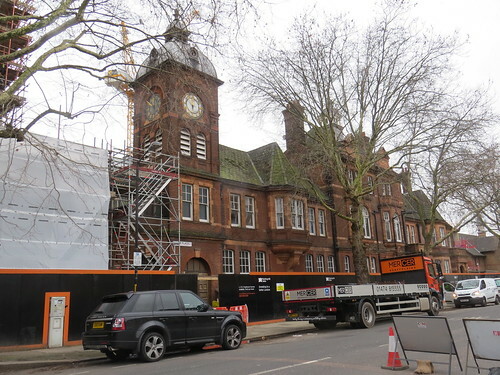 There were a few connections with well known names: Robert Browning, Charles Babbage, Michael Faraday and Charlie Chaplin, but oddly the SE17 locations actually connected with the last three of these seems less than clear. The other thing I did not find is any big cinema or theatre located along the Walworth Road, though there were a couple of independent cinemas, all traces of which have vanished. For onward travel, keep going along Chapter Road and then turn left into Braganza Street. You will find Kennington station at the end of Braganza Street. Alternatively return to Walworth Road for numerous buses. 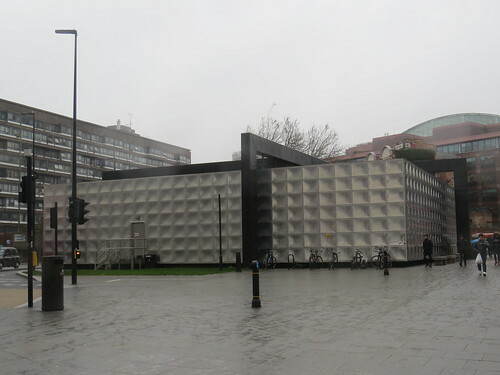 Until recently it stood in the middle of the roundabout at the northern end of the Elephant and Castle shopping centre between the ticket halls for the Northern Line and the Bakerloo Line stations. Now with the reordering of the roads it stand on a kind of peninsula and is easier to reach. 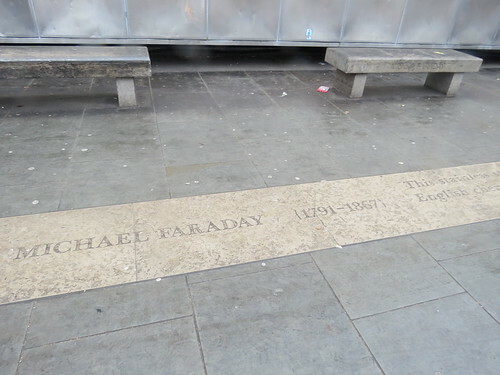 The Michael Faraday Memorial was designed by brutalist architect Rodney Gordon and dates from 1961. Like me you probably thought this was just a ventilation shaft that had been rather expensively clad. 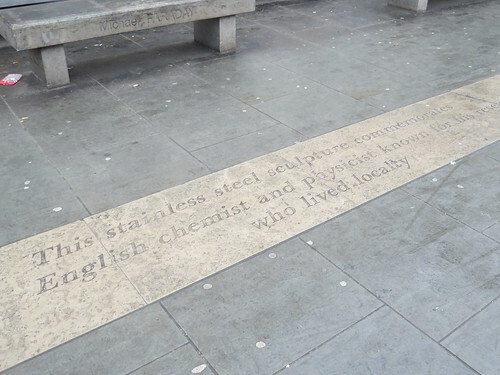 This entry was posted in SE post codes and tagged Charles Babbage, Charlie Chaplin, East Street market, London walks, Michael Faraday, Walworth by Stephen. Bookmark the permalink. When I came to London 50 years ago (from the north) I was instructed to go to Walworth Road. I spent a fruitless hour searching for Wharf Road.